IF the opening and closing ceremonies proved anything, Gold Coast vocal sensation Luke Harrison reckons they proved he can keep a secret. The 13-year-old student sang live in two numbers at the Commonwealth Games Closing Ceremony on Sunday after the Queen’s Baton Relay Song he recorded with musical director Katie Noonan in March was played at Carrara Stadium as the Queen’s Baton arrived and was handed over at the Opening Ceremony. “I was unable to tell anyone about my performance or involvement in the Games so now I know I can actually keep a secret,” Luke said. 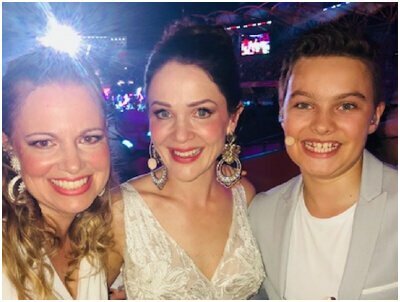 Gold Coast singer Luke Harrison performed with guitarist Karin Schaupp (left) and soprano Greta Bradman at the Commonwealth Games Closing Ceremony at Carrara Stadium. Picture: Supplied. “Katie Noonan is absolutely incredible,” he said. “She is an amazing musician, both singer and instrumentalist. She is so gifted musically — a true creative. She is extremely professional and treated me so well and with respect. Luke and fellow soprano Greta Bradman (granddaughter of Don) sang Elena Chernin’s work Eliza’s Aria during the Commonwealth Games Federation Flag Lowering and Handover segment in the Closing Ceremony, accompanied by guitarist Karin Schaupp and the Queensland Ballet. Gold Coast singer Luke Harrison joined artists including Guy Sebastian for Archie Roach’s performance of Put A Little Love in Your Heart at the Commonwealth Games Closing Ceremony. Picture: Supplied. He also featured as a backing vocalist in the Closing Ceremony finale when Archie Roach sang Put a Little Love in your Heart, joined by Guy Sebastian, Ricki Lee and The Veronicas. “Now that was soooo much fun,” Luke said. A multi-instrumentalist who plays piano, cello, drums and percussion, Luke worked closely with Noonan in the months leading up to the Games, recording the Queen’s Baton Relay Song with her in March. Gold Coast singer Luke Harrison and soprano Greta Bradman perform during the Commonwealth Games Closing Ceremony at Carrara Stadium. Picture: Supplied. “Whilst I was recording Eliza’s Aria prior to the Games, the music director Katie Noonan asked me if I could record an original song — the Queen’s Baton Relay Song she and recording/sound engineer for the Games Michael Tan had written,” Luke said. Gold Coast singer Luke Harrison performed in the Commonwealth Games Closing Ceremony. Picture: Supplied. A few weeks later, Luke learned the ‘executive committee’ overseeing the Games ceremonies had selected him and Noonan to perform the Queen’s Baton Relay Song at the Closing Ceremony as the baton entered Carrara Stadium to be handed over to the next Games host city of Birmingham. “I was very happy as you can imagine as I now had a role in both ceremonies,” Luke said. In addition to his many musical commitments – from school choirs, bands and orchestras to appearances in professional stage musicals and community theatre productions. Luke is also a handy basketballer and swimmer. The Closing Ceremony was panned by viewers and Channel 7 host Johanna Griggs live on-air after the network copped criticism for not showing the athletes entering the stadium, including flag bearer Kurt Fearnley. Asked how it felt performing centre stage at Carrara Stadium, Luke said he was both proud and excited. “Feelings of incredible excitement, honour and pride performing for my country, the Commonwealth and to a large television audience around the world and also live on the Gold Coast where I live,” he said. “I feel complete when I am on stage performing — it’s my passion and where I feel I belong so yes, I guess I felt comfortable doing what I love. Luke said he was surprised when the ceremonies and musical director Noonan were widely criticised. “I was surprised to hear about the criticism but understand everyone is entitled to an opinion,” he said. “For me, my focus was on my role as a performer and what I could bring to the Games through my passion and my personal experience was nothing other than positive. “Everyone treated me with respect and I did the same. After performing for such a big crowd in such a huge production, Luke admits he’s more determined than ever to chase his dreams. “Yes, I am hooked,” he said. Gold Coast singer Luke Harrison and Ricki Lee Coulter, who share a birthday, at the Commonwealth Games Closing Ceremony. Picture: Supplied. “Every experience I have as a performer cements that feeling that this is the right path for me. “For a month or so before the Games I recorded Eliza’s Aria and the Queen’s Baton Relay Song with Katie Noonan on the Gold Coast and I had three rehearsals the week before the Games — a stage orientation, microphone and costume check and a dress rehearsal. “It started to feel very real and exciting that week before. Gold Coast singer Luke Harrison with fellow artists who performed Eliza’s Aria at the Commonwealth Games Closing Ceremony including guitarist Karin Schaupp and soprano Greta Bradman. Picture: Supplied. Luke said appearing alongside and meeting so many well-known performers was also a highlight. “Everyone was very kind and nice and willing to chat with me and have a photo and a little fun,” he said. Archie Roach and Gold Coast teen Luke Harrison, who performed backing vocals for Roach during his performance at the Commonwealth Games Closing Ceremony. Picture: Supplied. “As I mentioned, I was also in the finale backing iconic singer Archie Roach and got to sing on stage with the stars like Guy Sebastian, Ricki Lee, the Veronicas and Dallas Frasca as we all backed Archie. “A highlight was meeting and chatting with Guy Sebastian, DamiIm and Ricki Lee (we share the same birthday). I also met Dallas Frasca, the Veronicas, Archie Roach, Kate Ceberano and the Koi Boys, who were very cool. Gold Coast singer Luke Harrison and DamiIm at the Commonwealth Games Closing Ceremony on Sunday. Picture: Supplied. The experience has already opened up a world of opportunity for Luke. “I have a TV interview in Melbourne on Thursday and some radio interviews on the Gold Coast coming up from the Games,” he said. “I am a lead role in my middle school musical, a techie and mentor for my school’s junior school musical The Lion King, which my sister Sophia has a lead role in. I plan to write another original song with my US record producer soon and I have just been signed by music management in Melbourne which will bring some exciting opportunities. “There is so much to keep busy with and I have to make time for school commitments, training, my instruments and sport”. Luke Harrison and his proud parents, Maria and Andrew Harrison, at The Greenroom Project Junior at The Arts Centre Gold Coast last year. Picture: Regina King. Luke is no stranger to recording, he travelled to the US last year to record the three-track CD Heaven’s Song, featuring his original title track and his versions of You Raise Me Up and The Prayer. See Luke’s website… https://lukeharrisonperformer.com for details.